Had a fantastic time on the Japan Deluxe Tours. I just wanted to tell you that I had a fantastic time on the Japan Deluxe Tours. I indeed did bring back fond memories of the beautiful country of Japan. I also wanted to commend our tour guide K***, she is very organized, nice and made the tour very smooth and comfortable for all, the drivers on both phases of the tour each were very prompt, friendly and safe drivers. 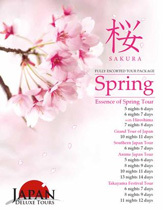 I hope to return soon to Japan and will definitely be traveling with Japan Deluxe Tours again, and will definitely recommend your Japan tour to friends and family.